A domain name is much more than just your website address. A domain name reflects your online identity. It represents your business and your blogs. Thousands of domain names are registered every day, you would surely want your name to stand out. You would want a name which is easily remembered and one which aptly describes your brand. But the question is how you can choose the right domain name for your website? Choosing the right domain name for your business is a difficult choice to make. 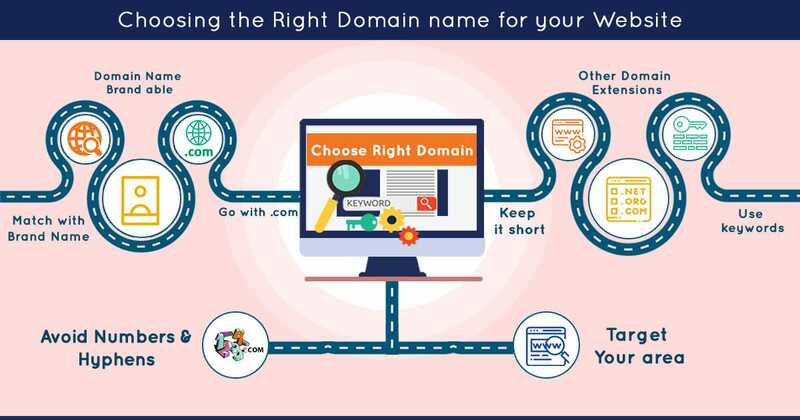 It is a very big decision for the business, as your domain name is more than the words which are typed in the browser, it is the foundation for your business’s online identity. If you end up choosing the wrong domain name it will be a huge disservice to your business. But, how exactly can you choose the right domain name for your business? If your domain name does not match with your brand name, then it is a bad branding technique. You should always try to use your brand name in your domain name, as it will help people in finding your website more easily when they hear about you and they try searching your name in the search engines. Making your domain name Brandable means that when people see your domain or hear about it, it should feel like a brand name to them. Just by reading your domain name your visitors or prospects should be able to understand what your website is going to be about and what you will offer. Go for a name which is going to let your customers know what they are in for from the minute they read it. Your website is expected to deliver what it states on the label, and your domain name is the label. While choosing your domain extension you will receive a number of options to choose from. One can be tempted to choose a TLD which sounds innovative and creative. However, it is always advisable to go with the standard TLD .com. The .com TLD is the most commonly used and acknowledged TLD. Mentally people have already built an association with .com, making it the primary TLD. Try using this to your advantage and build a higher-quality brand name and brand recognition by choosing .com. Once you have registered your .com domain name, try to pick up all the other top-level domain variations like .biz and .net also. Redirect these domain names to your .com site. This will help in retaining visitors who by mistake type in the wrong domain while trying to find your website. When you are doubtful regarding a name choice for your domain, try to make it as short as possible. A shorter name helps in making your brand more memorable. The lesser number of characters your domain has, it becomes easier for people to type it or say it or share with friends. It is not easy to find a single word domain name which is relatable to your business. You can consider combining two or three shorter words together to make an easy to remember name. In today’s times internet users generally use their smartphones for browsing the web, hence you need to keep it simple for them as they have type your domain name on a small gadget like a phone. Internet search depends on an outline of keywords and phrases which are used for indexing addresses and sites while ranking them. So why not take advantage of this? Try using keywords in your domain name which can describe your business. For example, if you have a television repair business, then you should try including “TV repair” in your domain name. This helps in improving your ranking on search engines, and at the same time makes it easier for customers to find you. Numbers and hyphens in domain names are often misheard or misinterpreted. People are not sure whether they have to use the numeral or spell out the number in the domain name. People tend to forget to use the dash or hyphen and hence end up not reaching your website. Using Hyphens in domain names makes it look like spam or unprofessional. If you have a local business, you should use your city name in your domain name. This is very helpful for local customers to search for you and remember your domain. For example, if your television repair shop is in Dallas, you can try DallasTVRepairs.com. Today every other person or business, big or small is creating their own websites. Because of this widespread growth, the choice for domain names is becoming more and more limited. Hence it is now important to be innovative, think outside the box, and think of a domain name which will last a lifetime. Next PostNext What is Google My Business (GMB) and its importance for your business?